Grand Central Publishing, 9781455523320, 288pp. Mitch Joel is president of Twist Image. Joel speaks frequently to diverse companies such as Walmart, Starbucks, Nestlé, Procter & Gamble, and Unilever, and was dubbed the "Rock Star of Digital Marketing" by Marketing magazine. His first book, the bestselling Six Pixels of Separation, is named after his successful blog and podcast. "In CTRL ALT Delete, Mitch Joel surveys the ways technology has transformed how brands and businesses create, connect, and adapt to a shifting new landscape. This book -- and especially the five new movements he identifies that are forcing brands to reboot -- is an indispensable read for a time when so much is in transition." "In CTRL ALT DELETE, Mitch Joel describes how you must learn to adapt, to learn, and to stay ahead of the curve online. This book will help prepare you for the future... now!" -- Tony Hsieh, NY Times Bestselling author of "Delivering Happiness" and CEO of Zappos.com, Inc.
"Writing with his signature blend of warmth and intelligence, in CTRL ALT Delete Mitch Joel delivers a crucial blueprint for running your business -- with humane intention and razor-sharp results." - Susan Cain, author of QUIET: The Power of Introverts in a World That Can't Stop Talking. "Too many brands, in their frantic effort to fashion a new business strategy, fail to build meaningful relationships with the customers they serve. Even fewer understand the new business landscape as it is (not as it once was). They need to listen to Mitch Joel. 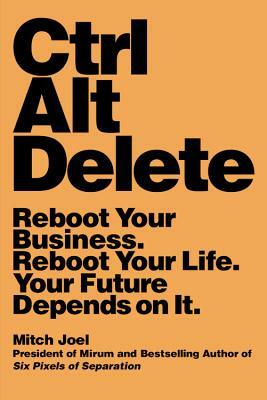 CTRL ALT DELETE is a wise and practical road map that can help you navigate today's challenging economic, social, physical and digital landscape." The way we work and do business is changing faster than most of us understand or can comprehend. Fortunately Mitch Joel has given us CTRL ALT Delete, a wonderful book full of his invaluable insight to help us navigate, adapt and survive these fundamental changes. "In Control Alt Delete, Mitch Joel shows us that in times of great uncertainty -- like ours -- flexibility, creativity, authenticity, and kindness are the keys to developing great businesses - and ourselves. His book is a wonderful guide through the new terrain." "In a world filled with broken promises, Mitch Joel is the real deal. He lives the work he talks about, and he does it with generosity and insight."